Johanna van Gogh-Bonger, his sister-in-law. For without Johanna, little of the inimitable Vincent would ever have become known. treatise Van Gogh and Nuenen, provides new insight into the artist’s life, true character, and his artistic genius. the foremost scholars on the celebrated artist, and beautifully illustrated in full color. Please note: We recommend that Volumes 1 and 2 be bought together. and lessons about the preciousness of life. Art historian and lecturer William J. Havlicek’s acclaimed book Van Gogh’s Untold Journey is based largely on Vincent’s astonishing letters of which over 900 exist. 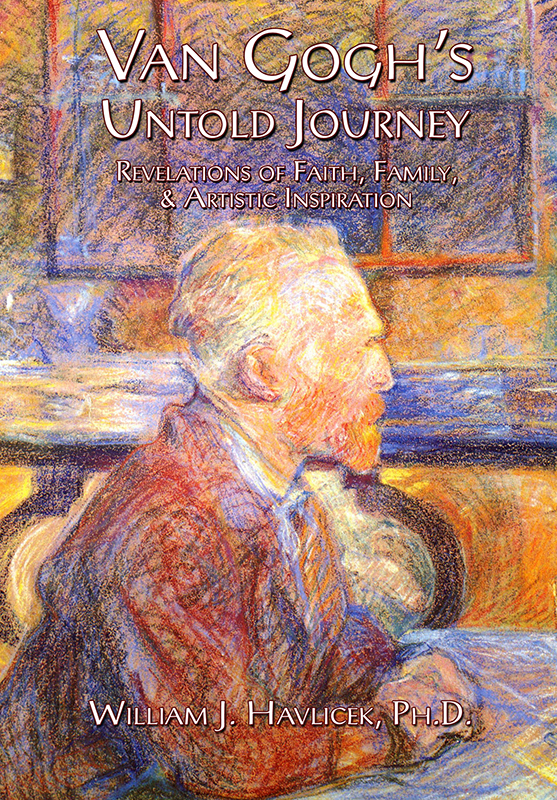 This important work, the result of over 15 years of research, provides new insight into the artist’s true character nurtured from his abiding faith, the influence of family, and the tender solicitude he felt for mankind. The book also holds some compelling revelations, among them the artist’s vicarious relationship with Charles Dickens, his early days as a missionary in the Borinage mining region of Belgium, and his fraught, often volatile, relationship with Paul Gaugin. Perhaps most revealing is Havlicek’s discovery of how the inspired words of Victor Hugo, embodied in one of the characters in his classic Les Misérables, gave Van Gogh the idea for one of his most celebrated paintings of all: The Starry Night. Vincent van Gogh lived and worked in Nuenen from December 1883 to November 1885. In retrospect, his stay in Nuenen was one of the most important and most productive periods in his life. He chose to take the daily hard life of his fellow man as the starting point for his painting. With great dedication, he made 194 paintings in Nuenen, including the now famous Potato Eaters, 313 drawings, 25 watercolors and 19 letter sketches. In Nuenen, there is still much to see from the period when Vincent and his family lived here. In the town’s museum (the Vincentre), Nuenen’s history of Vincent is brought together in words and images with faithfully reproduced photographs, paintings, drawings and letters. In addition, Nuenen itself and its surroundings form a collection in itself. No less than 21 buildings and landscapes have a direct relationship with Vincent’s two-year stay in Nuenen. Of those 21 objects, 14 have been painted or drawn by Vincent at least once. The other 7 buildings were not painted by him, but were mostly the houses where many of his ‘models’ lived. Some landscapes in the immediate vicinity still breathe the atmosphere of his time, and various routes along which he walked pass through this living collection, looking very much like they did over 100 years ago. The 2nd edition of Van Gogh en Nuenen in Dutch has been sold out for some time. But Ton de Brouwer and Creative Storytellers have now collaborated on a Third Edition, greatly enhanced with over 180 color images, and this First Edition in English. This is a wonderful story for both connoisseurs and those interested in Van Gogh, written by a passionate connoisseur and expert on one of history’s most charismatic artists. A Novel Based on Real Events & Circumstances. One Man Helped to Redefine Their Destinies. Thousands of children around the world are victims of transnational organised crime syndicates and individuals that profiteer from their trafficking, enslavement, and sexual exploitation. These criminal entities not only exploit children in real environments; they have also created a highly sophisticated subculture in cyberspace on both the supply and the demand side that is extremely difficult to track and intercept. Their illicit dealings in child exploitation often involve corrupt political and governmental figures, judges, doctors, lawyers and police officers—typically those in positions of power and influence. Based on real happenings and circumstances, this story tells of the desperate existence of four boys enslaved and exploited by a major organized crime ring, the horrors they must endure, and how they exist from day-to-day with little hope of salvation. But a chance encounter with one man, a retired intelligence officer, changes everything as he teaches them how to fight back in an effective, astute way using his knowledge of modern technology and his training in fieldcraft. Above all, he helps restore their dignity, and demonstrates how kindness, redemption and an indomitable spirit can lead them out of the dark underworld in which they live to a life of happiness and fulfillment. While a work of fiction, this story is told in a unique style by writer David A. Glen, drawing from personal experiences and also as Director of Strategic Operations for CTECC, a global tactical initiative to end the trafficking and exploitation of children by today’s multicultural and highly competitive mafia. In his narrative, Glen demonstrates how organized criminals have developed a potent reach into sectors of our government, how they can interpose themselves into our daily lives and, more importantly, how easily they can gain access to our children. Book Production from Concept to Completion. executives, talented graphic designers, and the burgeoning direct-mail and fulfillment business. The result has been a resurgence in paper books (and other print collateral such as magazines) simply because publishers can now entertain short print runs at reasonable per-unit prices. A small publishing house can now publish 500 or 1,000 books at a time, see how they perform in the marketplace, and go into reprint if necessary with a telephone call or email message. And any errors or omissions can be corrected in subsequent print runs. This has had a real impact on the rise of electronic books. Yet it’s important to cater to all needs. Younger generations are, to a great extent, reading on mobile devices. They still have good eyes! But a large portion of readers today are committed to print media; they love the feel of a good book, the smell of its paper, and the sense of ownership. There’s plenty of room in the market for both electronic and print versions. Notwithstanding the above, book publishing today is far more complex than one would think if—and this is important—we are to maintain the highest standards in our writing and in the production of our books. But keeping up with the ever-morphing technology and methodology is challenging to say the least. BOOK PUBLISHING TODAY, with its continually evolving, thoughtful and insightful content, keeps up for you. We hope you will take full advantage of this highly rewarding online resource, and keep abreast of the latest in printing and publishing know-how; glean fresh ideas and from talented and experienced book designers and graphic artists; discover new and effective ways to get books into their target markets and, if you’re a self-publishing author, maintain full control over your book from concept to completion.